Play Pharaoh´s Night online for free now! Dusty pyramids and venerable ancient Egyptian kings sitting motionless on their thrones? 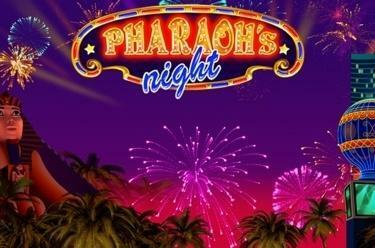 Not with Pharaoh´s Night: In this slot the pharoahs will turn night into day in their quick speedsters and enjoy the ambience of the big city, which leaves nothing to be desired for party people. Enjoy bread and games with them and cash in: If the sphinx winks at you during the free games the winnings are yours! Your aim with Pharaoh's Night is to land 5 identical symbols side by side along 30 win lines, which are running from left to right. In order to win, the winning symbols cannot be interrupted by other symbols between them. The Scatter symbols have a unique position ('Welcome Scatter'): If 3 of them land in any position on the reels you win. 3, 4 or 5 Scatters trigger 10, 25 or 50 free games respectively with Giant-Pyramid-Feature (expanding and moving Wild symbol). The sphinx is a Wild symbol, which replaces all symbols except Scatter and complements your winning patterns. 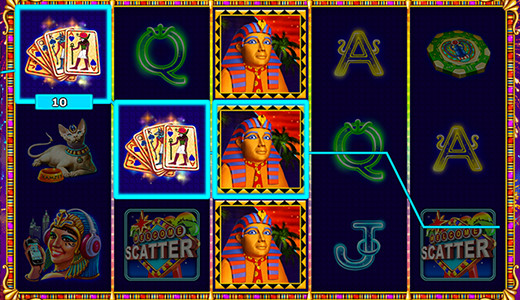 With 3, 4 or 5 'Welcome Scatter' symbols you will start a wild party night with the pharaohs: The Scatters trigger 10, 25 or 50 free games, which will use the bets and number of lines of your last regular game. If 3 sphinx symbols (Wild symbols) land on the reel on the far right during the free games they will occupy the entire reel and turn it into a Wild reel (big sphinx or pyramid). They will move one position to the left with every spin until they have reached the reel on the far left. If 3, 4 or 5 additional Scatter symbols appear during the free games you win further free games.